The Crimean status referendum was a controversial vote on the political status of Crimea held on March 16, 2014 by the legislature of the Autonomous Republic of Crimea and the local government of Sevastopol (both subdivisions of Ukraine). The referendum requested local populations whether they wanted to join Russia as a federal subject, or if they wanted to restore the 1992 Crimean constitution and Crimea's status as a part of Ukraine. After the events of Euromaidan, the referendum was held during a Russian military takeover of Crimea. The referendum is not internationally recognized by most countries. In 1991 and 1994, Crimea passed referendums in support for greater Crimean autonomy within Ukraine's sovereignty. Most recently, members of the Supreme Council of Crimea claimed the ousting of Ukrainian President Viktor Yanukovych in the 2014 Ukrainian revolution was a "coup" and the new interim government in Kiev was illegitimate and stated that the referendum was a response to these developments. Following the referendum, The Supreme Council of Crimea and Sevastopol City Council declared the independence of the Republic of Crimea from Ukraine and requested to join the Russian Federation. On the same day, Russia recognized the Republic of Crimea as a sovereign state. The referendum was regarded as illegitimate by most members of the European Union, the United States and Canada mainly due to Russian intervention. Thirteen members of the United Nations Security Council voted in favor of a resolution declaring the referendum invalid, but Russia vetoed it and China abstained. A United Nations General Assembly resolution was later adopted, by a vote of 100 in favor vs. 11 against with 58 abstentions, which declared the referendum invalid and affirmed Ukraine's territorial integrity. As the plebiscite was proclaimed, the Mejlis of the Crimean Tatar People had called for a boycott of the referendum. The Mejlis Deputy Chairman, Akhtem Chiygoz, felt that the actual turnout could not have exceeded 30–40 percent, arguing that to be the normal turnout for votes in the region. Linguistic map of Ukraine according to the 2001 census, with Russian (in red) dominant in Crimea. Distribution of ethnicities in the Autonomous Republic of Crimea (which doesn't include Sevastopol) according to the 2001 census. Ethnic Russians comprise a majority at 58%. According to the 2001 Ukrainian population census, 65.3% of the population of the Autonomous Republic of Crimea are ethnic Russians, 15.7% are ethnic Ukrainians and 12.2% are Crimean Tatars. In Sevastopol, 71.6% are ethnic Russians and 22.4% are ethnic Ukrainians. 77% of Crimea's and 94% of Sevastopol's population are native speakers of Russian. Crimea and Sevastopol are neighboring subdivisions of Ukraine located in the Crimean peninsula, a region with a long and complex history. Demographically, the region is currently populated by Russian-speaking majorities but with such demographics undergoing dramatic changes for the past 200 years, due in part to the deportation of the Crimean Tatars 70 years ago. Following the Tatar deportation, large numbers of ethnic Russians and ethnic Ukrainians settled in the region. 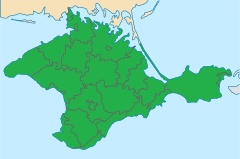 During the period of the Soviet Union, the Crimean Oblast was a subdivision of the Russian Soviet Federative Socialist Republic until the 1954 transfer of Crimea into the Ukrainian SSR. Crimea became part of independent Ukraine after the dissolution of the Soviet Union, shortly after Crimea had re-gained its autonomy following a 1991 referendum. The Ukrainian parliament abolished the 1992 Crimean Constitution and the office of President of Crimea in 1995. In 1998, Crimea gained a new constitution, which granted it less autonomy; notably, any legislation passed by the Crimean parliament could be vetoed by the Ukrainian parliament. Polling by the Razumkov Centre in 2008 found that 63.8% of Crimeans (76% of Russians, 55% of Ukrainians, and 14% of Crimean Tatars, respectively) would like Crimea to secede from Ukraine and join Russia and 53.8% would like to preserve its current status, but with expanded powers and rights. Razumkov characterized Crimeans' views as controversial and unsteady, and therefore vulnerable to internal and external influences. A poll by the International Republican Institute in May 2013 found that 53% wanted "Autonomy in Ukraine (as today)", 12% were for "Crimean Tatar autonomy within Ukraine", 2% for "Common oblast of Ukraine" and 23% voted for "Crimea should be separated and given to Russia". A poll conducted by the Crimean Institute of Political and Social Research on March 8–10, 2014 found that 77% of respondents planned to vote for "reunification with Russia", and 97% assessed the current situation in Ukraine as negative. A poll conducted by the GfK Group on March 12–14, 2014 with 600 respondents found that 70.6% of Crimeans intended to vote for joining Russia, 10.8% for restoring the 1992 constitution and 5.6% did not intend to take part in the referendum. The poll also showed that if Crimeans had more choices, 53.8% of them would choose joining Russia, 5.2% restoration of 1992 constitution, 18.6% a fully independent Crimean state and 12.6% would choose to keep the previous status of Crimea. Different polls conducted by the Kyiv International Institute of Sociology (KIIS) in the Autonomous Republic of Crimea found a 36% support for unification of the entire Ukraine with Russia in 2013 and 41% on February 8–18, 2014 (just days before the ousting of Viktor Yanukovych). A post-referendum survey, commissioned by John O'Loughlin, College Professor of Distinction and Professor of Geography at the University of Colorado in Boulder, and Gerard Toal (Gearóid Ó Tuathail), Professor of Government and International Affairs at Virginia Tech's National Capital Region campus, was conducted during December 2014 by the Levada-Center, and published in Open Democracy on March 3, 2015. The survey showed "widespread support for Crimea's decision to secede from Ukraine and join the Russian Federation one year ago." While the authors of that survey felt and opined that Crimea's secession was "an illegal act under international law," they also acknowledged "It is also an act that enjoys the widespread support of the peninsula's inhabitants, with the important exception of its Crimean Tatar population." Despite the survey's distinction of Crimean Tatar support for accession to Russia being lower than the support from the rest of Crimea's population, the survey still found that significantly more Crimean Tatars either felt that Crimea's secession from Ukraine and accession to Russia was either the "Absolutely right decision," or the "Generally right decision," than the number of Crimean Tatars who felt that the 2014 referendum outcome was the "Wrong decision." Overall, the survey found that 84% of Crimeans felt that the choice to secede from Ukraine and accede to Russia was "Absolutely the right decision." A third post-referendum survey, carried out by the Russia public opinion research center VCIOM in February 2015, found that 49% of Crimean Tatars would support the majority decision to leave Ukraine and join Russia if the referendum was to be repeated, while only a quarter of Crimean Tatars said they'd vote to remain in Ukraine. VCIOM's poll also found support for the 2014 Crimean referendum outcome to be 97% in favour from Crimea's ethnic Russia population, 91% in favour from Crimea's ethnic Ukrainian population, and 92% in favour from all other populations of Crimea, for a total of 90% of Crimea's complete population being in favour of the 2014 Crimean referendum outcome to leave Ukraine and accede to Russia. Russian president Vladimir Putin has experience with similar referenda. According to Vladimir Chuykin, who was head of Narva city council in 1993, Putin (who was the Saint Petersburg city official) aided the Russian majority population in the Estonian city in a referendum on autonomy that was later regarded as unconstitutional. The Narva referendum was not backed by Moscow. Cossacks were amassed on the other side of the Narva River before the referendum. Putin and St. Petersburg mayor Anatoly Sobchak managed to prevent Cossacks from crossing the border. Request made in Russian language by the Ukrainian Council of Ministers of Crimea to the Ukrainian 55th Anti-Aircraft Artillery regiment in Yevpatoria to lay down arms under control of the Russian Black Sea Fleet for the period of the referendum. On February 27, amidst tensions in the region during the Ukrainian revolution, the Supreme Council of Crimea voted to hold a referendum on the status of Crimea on May 25. Olha Sulnikova, head of information and analysis department of parliament, reported on the phone from inside the parliamentary building that 61 of the registered 64 deputies had voted for the referendum resolution and 55 for the resolution to dismiss the government. Interfax-Ukraine reported that, "it is impossible to find out whether all the 64 members of the 100-member legislature who were registered as present, when the two decisions were voted on or whether someone else used the plastic voting cards of some of them" because due to the armed occupation of parliament it was unclear how many members of parliament were present. Enver Abduraimov, member of the parliament presidium, said that he did not go inside when he saw that armed guards who secured the building were confiscating all communications devices from deputies. Andriy Krysko, head of the Crimean branch of the Voters Committee of Ukraine, announced that no one from the parliament secretariat was in the building when voting took place. Originally the referendum was to be about the status of Crimea within Ukraine and was initially set for May 25, but later, on March 1, it was pushed back to March 30. The referendum was approved by the Supreme Council of Crimea on February but the Central Election Commission of Ukraine denounced it by stating that the Crimean authorities do not possess the legal jurisdiction to conduct it. Regarding the referendum's initial purpose, the Daily Telegraph reported on February 27, that it, "appears to be for greater autonomy within Ukraine rather than for full independence." On March 4, the district administration court of Kiev nullified the no confidence vote in the Council of Ministers of Crimea and the appointment of Sergey Aksyonov as Prime Minister of Crimea and declared the organization and conduct of the referendum as illegal. On March 6, the Supreme Council changed the date of the referendum from March 30 to 16 and changed the choice for the referendum from greater autonomy to accession to the Russian Federation. This decision was made with 78 votes in favor and 8 abstentions. Concerns were raised about the presence of armed forces outside the parliament and reports of lawmakers being denied access to the vote. Later that day, acting President Turchynov announced "In accordance with power I am conferred on, I have stopped the decision of the Crimean parliament. The Verkhovna Rada of Ukraine will initiate dissolution of the parliament of the Autonomous Republic of Crimea. We will defend the inviolability of the Ukrainian territory." On March 11 in their joint Declaration of Independence of the Republic of Crimea, the Supreme Council of Crimea and the Sevastopol City Council expressed their intention to join with Russia pending a supporting result in the referendum. On March 14 the Crimean parliament removed the coat of arms of Ukraine from its building. Several hundred residents of Crimea, mainly Crimean Tatars, left Crimea for security reasons according to the State Border Guard Service of Ukraine. The referendum was to be decided by a simple majority with the choice with the most votes declared winner. [b] Media outlets reported different translations for each choice and labeled them as "questions" which has created some confusion and inconsistencies on the matter. The city of Sevastopol, which is also located in the Crimean peninsula but administered separately from the Crimean republic, was also included in the referendum process. However, on March 6, 2014, Sevastopol unilaterally declared itself a federal subject of the Russian Federation. Many commentators, including The New York Times, Kyiv Post, and Fox News argued that both choices would result in de facto independence. The ballot was printed in three languages: Russian, Ukrainian and Crimean Tatar (in the Cyrillic script). Transparent voting boxes are customary in Ukraine. There were two simultaneous referendums, one organised by the city council of Sevastopol and another organised by a special committee set up by the Autonomous Republic of Crimea. Only Crimean residents with Ukrainian passports were allowed to vote. The voting boxes were transparent and the ballots were not placed in envelopes making some of the marked ballots visible through the box walls. The referendum rules did not state if there was a threshold number of votes needed for the result to be enacted. The reactions of many nations to the referendum—particularly of Western-nations—were addressing the matter of Crimean secession from Ukraine, whereas the Crimean referendum itself was not about secession from Ukraine, but took Crimea's secession from Ukraine to already be de facto following its government's declaration. [original research?] Crimea's March 16 referendum occurred following the March 11 declaration of Crimea's independence from Ukraine made by Crimea's parliament, which was made following a controversial parliamentary vote of 78 in favour of, and 22 against Crimea's secession from Ukraine. Both of the ballot options for the March 16, 2014 Crimean referendum acknowledged that Crimea was already an independent state at that time, despite the declaration of independence occurring without a national vote in Ukraine, as the constitutions required. The interim Ukrainian government, United States, European Union, and several other bodies stated that any referendum held by the local government of Crimea without the express authority of Ukraine is unconstitutional and illegitimate. The interim government in Kiev and the pro-Russian Crimean faction do not recognize each other as legitimate. Additionally, the Mejlis of the Crimean Tatar People—the unofficial political association of the Crimean Tatars—called for a boycott of the referendum. Russia and the Crimean parliament argue that the referendum is legal, citing the UN recognized right of self-determination and the advisory opinion on Kosovo in which the International Court of Justice declared that international law contains no prohibition against declarations of independence. Legal scholars have disputed the validity of the Kosovo analogy. According to article 73 of the 1996 Constitution of Ukraine and article 3 of the 2012 Ukrainian law "On all-Ukrainian referendum", territorial changes can only be approved via a referendum where all the citizens of Ukraine are allowed to vote, including those that do not reside in Crimea. The Central Election Commission of Ukraine also stated that there are no judicial possibilities, according to the legislation of Ukraine, to initiate such changes. The Venice Commission declared that the referendum was illegal under both Ukrainian and Crimean Constitutions, and violated international standards and norms. The Venice Commission stressed that self-determination was to be understood primarily as internal self-determination within the framework of the existing borders and not as external self-determination through secession. Moreover, the Venice Commission opined, any referendum on the status of a territory should have been preceded by serious negotiations among all stakeholders, and that such negotiations did not take place. Many scholars and politicians (Neil Melvin, Robert McCorquodale, John Kerry, John B. Bellinger III, Marc Weller among others) have stated that the referendum was conducted under the cover of assault rifles and, thus, the result was obtained through violence. However, according to Russia Today and ITAR-TASS those claims are not substantiated by the international observers of the pro-Kremlin European Center of Geopolitical Analysis, Polish Eurasian Mateusz Piskorski (leader of the European observers' mission according to the Kremlin media outlet Russia Today), the FPÖ's Ewald Stadler and Johannes Hübner, Pavel Chernev, Aymeric Chauprade, Tatjana Ždanoka, Srđa Trifković, who said they saw no signs of pressure or military presence during the referendum, and that the Crimean people were genuinely eager to have their say in the vote. Party of Regions MP Yuriy Miroshnychenko claimed on March 11 that "the Crimean referendum is illegitimate, and its holding must be immediately stopped". Another Party of Regions MP, Hanna Herman, commented the same day about Yanukovych's press conference, "He needs to ... prevent the illegal referendum". President of Russia Vladimir Putin during his conversation with Mustafa Dzhemilev, a former Chairman of the Mejlis of the Crimean Tatar People, stated that Ukrainian Independence from the Soviet Union was not obtained legitimately,[d] while maintaining that the Crimean referendum followed all international-law, the UN charter, and the convention established by Kosovo's NATO-prodded annexation from Serbia. According to BBC News the campaign leading up to the referendum was "almost entirely pro-Russian". Pro-Russia election posters often featured crossed-out swastikas in an alleged attempt to be saying "No" to the Ukrainian government, who they alleged to be neo-Nazis. Shortly after the referendum was called Ukrainian TV channels were made unavailable for Crimean viewers, some of them were replaced with Russian stations. BBC News also stated it had received reports of violence against pro-Ukrainian activists. Unsigned billboards and leaflets campaigning for the referendum, describing new Ukraine government as fascists and showing economic reasons to join Russia, appeared throughout Crimea. The next week, far-right Ukraine MP Igor Miroshnichenko and five enforcers filmed themselves beating up Oleksandr Panteleymonov, head of the First National TV Channel, then forcing him to sign his resignation and hand over the Ukraine TV station on camera, for broadcasting news about Russia. MP Miroshnichenko is a member of Ukraine's Freedom of Speech committee. On March 10, 2014 the de facto Prime Minister of Crimea, Sergey Aksyonov, made an unofficial verbal invitation to OSCE to monitor the plebiscite. However, later in the day, an OSCE spokeswoman said that Crimea did not have the authority to invite the organization into the region as it is not a fully-fledged state and, therefore, incapable of requesting services provided exclusively to OSCE members. On March 11, the OSCE chair, Switzerland's Foreign Minister Didier Burkhalter, declared the referendum as unconstitutional and therefore the OSCE would not send observers. OSCE military observers attempted to enter the region four times but were turned away, sometimes after warning shots were fired, which was another reason given for not dispatching referendum observers. OSCE also published a report about their observations which "produced significant evidence of equipment consistent with the presence of Russian Federation military personnel in the vicinity of the various roadblocks encountered". The UN Human Rights Envoy Ivan Šimonović had to cancel his trip to Crimea as the current situation did not permit his travel. He intended to observe the human rights situation which was Russia's explanation for its engagement in Crimea. Media and referendum organizers said that from nearly 70 to 135 international observers monitored the referendum without reporting any violations, but the objectivity of these has been questioned, because many of them had ties to far-right extremist groups. According to reports by the state media, observers to the 2014 Crimean referendum included members of the European Union's parliament, as well as MPs from various European nations, including Austria, Belgium, Bulgaria, France, Germany, Hungary, Italy, Latvia and Poland, and that observers quoted regarding the conditions of the referendum corroborated claims of the referendum having adhered to international standards, with no irregularities or breaches of democracy. According to Yale historian Timothy Snyder, the Russian government invited individuals belonging to European far-right, anti-semitic and neo-Nazi parties to serve as observers. At least some of the international observers were managed and financed by the Eurasian Observatory for Democracy & Elections (EODE), a far-right, NGO international election-monitoring organization. Exit-polls were allowed only for the Republican Institute of Sociological Research since, according to Russia-24, no other organizations have applied for accreditation for exit polls. A Russian journalist claimed that she was allowed to vote even after admitting she was a Russian citizen with only a temporary one-year permit to live in Crimea. "According to all the laws, this is illegal," she said in one interview. "I am a foreign citizen. How can I decide the destiny of the Crimean Autonomous Republic of Ukraine?" The chairman of the electoral campaign of the Mejlis of the Crimean Tatar People claimed officials did not check carefully whether voters' names were on the electoral register and that some voters were bussed in to Bakhchysarai to increase participation rates in the city. Mejlis also stated that only 34.2% of Crimea residents participated in the referendum. There were a few reports of people confiscating identification documents before the voting day. Simferopol city administration confirmed these claims and declared these actions unlawful. A senior US official claimed there was "concrete evidence" of some ballots having been pre-marked. According to three Czech observers funded by the pro-Russian far-right non-governmental organization Eurasian Observatory for Democracy & Elections, deputy Stanislav Berkovec reported that the voting was free and the foreign deputies could move freely. According to his discussions with people, even the Tatars inclined towards Russia. Another deputy Milan Šarapatka reported that the referendum was formally regular and that there was no evidence of pressure on voters. According to Miloslav Soušek (the Vysoké Mýto mayor), the course of the referendum was comparable to the elections in the Czech Republic, he saw no soldiers in the town. According to the Central Election Commission of Ukraine on February 28, 2014 there were 1,534,815 registered voters in the autonomous republic of Crimea and 309,774 in the city of Sevastopol, which totals to 1,844,589 voters in the both Ukrainian regions. In the evening of March 16, 2014, Mikhail Malyshev, the Crimean election Spokesman, reported that as of 20:00, 1,250,427 people or 81.36% voted in the Autonomous Republic of Crimea and 274,136 or 89.50% voted in Sevastopol for a total of 1,524,563 or 82.71% of the electorate. ITAR-TASS initially reported this as 1,724,563 voters in total, but corrected it later. The discrepancy led to some reports of a 123% turnout in Sevastopol. On May 5, the Russian President's Human Rights Council posted a report to their site about human rights in Crimea based on interviews with roughly 20 local human rights activists conducted over the course of two and a half days. One member of the council, Yevgeny Bobrov, reported the opinion that the "vast majority of the citizens of Sevastopol voted in favor of unification with Russia in the referendum (50–80%)" and that "in Crimea, various data show that 50–60% voted for unification with Russia, with a turnout of 30–50%". On 7 May the Council stated that the report was not an official position of the Council. Mustafa Dzhemilev, a recent Chairman of the Mejlis of the Crimean Tatar People, reports that according to his sources the actual turn-up was only 32.4%, however he did not provide any evidence to support this claim. Mejlis Deputy Chairman Akhtem Chiygoz argued that voter turnout in the referendum among Crimeans did not exceeded 30–40 percent, but he did not provide any evidence either. Andrey Illarionov, a senior fellow at the Cato Institute and a former Russian government adviser, cited results of previous polls over past three years showing the Crimean support for joining Russia between 23 and 41 percent to conclude that the actual support for the reunification of Crimea with Russia was about 34 percent and that at least two thirds of Crimea did not vote for it. He called the referendum a "grossly rigged falsification" and the outcome "cynically distorted". The results of the survey by the Broadcasting Board of Governors, conducted April 21–29, 2014, showed that 83% of Crimeans felt that the results of the March 16 referendum on Crimea's status likely reflected the views of most people there. Whereas, this view is shared only by 30% in the rest of Ukraine. According to the Gallup's survey performed on April 21–27, 82.8% of Crimean people consider the referendum results reflecting most Crimeans' views, and 73.9% of Crimeans say Crimea's becoming part of Russia will make life better for themselves and their families, while 5.5% disagree. According to survey carried out by Pew Research Center in April 2014, majority of Crimean residents say the referendum was free and fair (91%) and that the government in Kyiv ought to recognize the results of the vote (88%). A poll of the Crimean public was taken by the Ukrainian branch of Germany's biggest market research organization, GfK, on January 16–22, 2015. According to its results: "Eighty-two percent of those polled said they fully supported Crimea's inclusion in Russia, and another 11 percent expressed partial support. Only 4 percent spoke out against it. ... Fifty-one percent reported their well-being had improved in the past year." Bloomberg's Leonid Bershidsky noted that "The calls were made on Jan. 16–22 to people living in towns with a population of 20,000 or more, which probably led to the peninsula's native population, the Tatars, being underrepresented because many of them live in small villages. On the other hand, no calls were placed in Sevastopol, the most pro-Russian city in Crimea. Even with these limitations, it was the most representative independent poll taken on the peninsula since its annexation." Most countries that have taken a position on the Crimean referendum have condemned it as a breach of Ukrainian sovereignty. Only a few countries, including Armenia, Kazakhstan, Russia, and several breakaway states supported by Russia have endorsed the vote. The Ukrainian government has announced it will not recognise the referendum. Acting president Oleksandr Turchynov stated: "It is not a referendum, it is a farce, a fake and a crime against the state which is organised by the Russian Federation's military." Former Prime Minister Yulia Tymoshenko alleged Russian coercion in allowing the referendum and that the international community should not allow it to happen. European Union – All 28 member states of the European Union believe the separation of the Crimea from Ukraine to be unacceptable under international law. The European Parliament rejected the referendum on independence in Crimea, which they saw as manipulated and contrary to international and Ukrainian law. G7 world leaders said that they would not recognize the results of a referendum for Ukraine's Crimea region. The leaders called on Russia to "immediately" halt actions supporting the referendum on Crimea regarding its status. UN On March 15, the United Nations Security Council voted 13–1 (with one abstention: China) to condemn the referendum, but Russia vetoed the draft resolution. On April 16, Assistant Secretary-General for Human Rights Ivan Šimonović has briefed the Security Council on the situation in Ukraine, and turning to his March 21 to 22 visit to Crimea he said "Media manipulation significantly contributed to a climate of fear and insecurity in the period preceding the referendum, and the presence of paramilitary and so-called self-defence groups, as well as soldiers in uniform but without insignia, was not conducive to an environment in which voters could freely exercise their right to hold opinions and the right to freedom of expression". UN The United Nations General Assembly approved a resolution describing the Crimean referendum as illegal. One hundred countries voted in favour of approving a UN General Assembly resolution declaring the Crimean referendum illegal and affirming Ukraine's territorial integrity. Eleven nations voted against, with 58 abstentions. The Monitoring Committee, in its report that was the basis for PACE resolution No. 1988 (2014) of April 9, 2014, questioned the official outcome of the referendum. Russians accounted for only 54% of the population and around 36% were Crimean Tatars and ethnic Ukrainians, who had announced a boycott of the referendum. The authors of the report argued that the combination of an 82% turnout and a 96% vote in favor of annexation was therefore implausible. NATO NATO – Secretary-General Anders Fogh Rasmussen said on March 14, "a planned referendum in Ukraine's Crimea region would violate international law and lack legitimacy". On April 12, NATO published a fact sheet claims that "the referendum was illegal according to the Ukrainian constitution, which states that questions of altering the territory of Ukraine are resolved exclusively by an All-Ukrainian referendum and was organized in a matter of weeks by a self-proclaimed Crimean leadership that was installed by armed Russian military personnel after seizing government buildings". Venice Commission – Experts of the Council of Europe for constitutional law have said that the referendum in Crimea on the peninsula's joining Russia which the Crimean authorities plan to hold on March 16 is illegal and it is not in line with the Constitution of Ukraine. The Council of Europe's so-called Venice Commission which is made up of independent constitutional experts said Crimea's vote to secede was undemocratic and violated Ukraine's constitution. Crimea's referendum to join Russia was "illegal", an advisory body of the pro-democracy Council of Europe said on March 21, as East-West tensions mounted over Moscow's annexation of the Ukrainian peninsula. The Venice Commission has emphasized that the right to self-determination should be understood primarily as an internal self-determination within the existing borders, and not as an external self-determination through secession. In addition, any referendum on the status of the territory requires serious preliminary negotiations with all interested parties, and there were not such negotiations. Afghanistan – The office of President Hamid Karzai said that Afghanistan respected "decision the people of Crimea took through a recent referendum that considers Crimea as part of the Russian Federation". Some sources stated that Afghanistan's government's break with its allies may have been due to Afghanistan's own irredentist aspirations to similarly regain Pashtun-inhabited parts of Pakistan. Albania – The Ministry of Foreign Affairs of the Republic of Albania described the referendum as illegal in a statement and strongly objected to the idea that the declaration of independence of Crimea should be treated in the same manner as the declaration of independence of Kosovo. After the referendum, the Ministry reiterated its stance, saying the referendum set a dangerous precedent. Argentina – The President of Argentina Cristina Fernández de Kirchner, whose nation currently is a non-permanent member of the United Nations Security Council, criticized the United States, the European Union and the United Kingdom pointing out the hypocrisy that stems from them trying to act as the "world's police force". Kirchner further stated the double standards of the aforementioned bodies by stating that "My country is suffering an encroachment in the Malvinas Islands by the United Kingdom, and the major powers have spoken in favor of the referendum that 'kelpers' had: that is double standard. Can not agree with the regional integrity in Crimea but not Argentina's", in reference to the Falkland Islands sovereignty dispute and its recent referendum in 2013. Armenia – Foreign Minister Eduard Nalbandyan said on March 17 that Armenia is "for the settlement of the Ukrainian crisis through dialogue, in peaceful and negotiated manner based on the UN Charter, international law." During a phone conversation with Putin on March 19 President Serzh Sargsyan said the referendum in Crimea was an exercise of peoples' right to self-determination via free expression of will. Both leaders highlighted the importance of a commitment to the norms and principles of international law. Asbarez commented that Sargsyan "apparently recognized Crimea's referendum to secede from Ukraine and join Russia." In response, on March 20, Oleh Tyahnybok, the leader of the Ukrainian far-right Svoboda, urged to recall the Ukrainian ambassador to Armenia. Australia – Foreign Minister Julie Bishop has rejected the legitimacy of the referendum, given the brief time frame, the disregard of the Ukrainian constitution and the presence of Russian troops on the peninsula. Australia also imposes sanctions on Russia. Belarus – The position of President Alexander Lukashenko is vague: it includes "Ukraine should remain an integral, indivisible, non-aligned state" and "As for Crimea, I do not like it when the integrity and independence of a country are broken", on the one hand, and "Today Crimea is part of the Russian Federation. No matter whether you recognize it or not, the fact remains." and "Whether Crimea will be recognized as a region of the Russian Federation de jure does not really matter", on the other hand. Canada – Prime Minister Stephen Harper said the Canadian government will not recognise the result and that the region was under "illegal military occupation." China – Foreign Ministry spokesperson Hong Lei said, "China always respects all countries' sovereignty, independence and territorial integrity. The Crimean issue should be resolved politically under a framework of law and order. All parties should exercise restraint and refrain from raising the tension." Finland – The Foreign Ministry described the referendum as "against the Ukrainian constitution and, as such, illegal" and said it would "only aggravate the situation further". France – Foreign Minister Laurent Fabius said that the referendum in Ukraine's Crimea region planned for March 16 is illegitimate and the annexation of Crimea by Russia would be illegal. French President François Hollande told his Russian counterpart, Vladimir Putin, in a phone call that the referendum planned in Crimea "has no legal basis." Georgia – On March 16, the Foreign Ministry released a statement saying it "does not recognize the referendum" as it occurred "amid pressure from Russian armed forces, in defiance of the universally recognized norms and principles of international law, with complete disregard for the Ukrainian national laws." It added, "Russia's attempt to annex Crimea represents a blatant violation of the commitments it has undertaken both under multilateral and bilateral agreements." On March 17, President Giorgi Margvelashvili called it an "illegal referendum" and expressed his "extreme concern". He said that "it is unimaginable to speak about free choice and free expression of people's will, where the situation is controlled by foreign, namely Russian, armed formations." He asserted that Georgia does not recognize the referendum and support Ukraine's sovereignty and territorial integrity. Germany – Chancellor Angela Merkel called the referendum "illegal and incompatible with Ukraine's constitution." Hungary – The Ministry of Foreign Affairs regarded "the changing of the legal status of Crimea as illegitimate and unlawful", emphasizing that it "remains committed to Ukraine's sovereignty, independence and territorial integrity." Iceland – On March 14, the Foreign Minister Gunnar Bragi Sveinsson released a statement saying "The forthcoming referendum Crimea is taking place under Russian occupation. It is not in accordance with international law and is only bound to increase tensions in the region. It goes without saying that the outcome of such a referendum cannot be validated". India – India stated "There are legitimate Russian and other interests involved and we hope they are discussed and resolved." Further India made it clear that it will not support any "unilateral measures" against Russian government. "India has never supported unilateral sanctions against any country. Therefore, we will also not support any unilateral measures by a country or a group of countries against Russia." Indonesia – The Minister of Foreign Affairs Marty Natalegawa stated, as instructed by the President Susilo Bambang Yudhoyono, stated that Republic of Indonesia does not recognize the Crimean referendum which is viewed as a violation of Ukrainian unity and sovereignty. Kazakhstan – Kazakhstan views the referendum held in Crimea "as a free expression of will of the Autonomous Republic's population". Kyrgyzstan – Kyrgyzstan views the interim Ukrainian government as legitimate and has stated concern over the crisis, and condemns any activities aimed at destabilizing the situation in Ukraine. Nevertheless, the country recognized the referendum results as reflecting "the views of the region's absolute majority." Japan – Foreign Minister Fumio Kishida announced a set of sanctions against Russia for its recognition of Crimea as an independent state. Japan does not recognize the outcome of Crimea's referendum to split from Ukraine, saying it violates the Ukrainian constitution, and the country's sanctions to Russia involve suspension of talks on relaxing visa requirements between the two countries as well as planned talks on investment, space and military. Lithuania – Lithuania supports and recognizes Ukraine's territorial integrity, including Crimea. Foreign Minister Linas Linkevičius has labeled the referendum as unhelpful in engendering a solution to the crisis. Norway – On March 14, the Foreign Minister Børge Brende released a statement saying "the referendum in Crimea, if it is held on Sunday as planned, is in violation of international law and lacks legitimacy". Philippines – The Department of Foreign Affairs released a statement saying that the Philippines is concerned over developments in Crimea, and urges all parties to exercise maximum restraint under United Nations General Assembly Resolution 3314. The DFA also urged for "comprehensive, inclusive and peaceful dialogue and reconciliation, with full respect for the rule of law". Poland – The Minister of Foreign Affairs Radosław Sikorski told Corriere della Sera on March 16, 2014, that the Crimean referendum was a farce under the barrel of a gun, reminiscent of the 19th-century territorial acquisitions. Following a working visit of the Polish delegation in Kyiv, the MFA Press Office stated on April 1, that Poland have allocated nearly half a million zloty toward expert assistance for the Ukrainian regional reforms. Romania – President Traian Băsescu issued a statement declaring that: "Romania considers the referendum illegal, and will not recognize the results". Foreign Minister Titus Corlățean called it "illegal and illegitimate" and "a violation of the Ukrainian Constitution", adding that the "result will not be recognized by the democratic international community". Russian Federation – Chairman of the Federation Council, Valentina Matviyenko, said that Russia will welcome Crimea to the Federation if the referendum passes. President Vladimir Putin has further solidified Russia's position on the matter, stating: "The steps taken by the legitimate leadership of Crimea are based on the norms of international law and aim to ensure the legal interests of the population of the peninsula." During a phone call with once deported, former leader of the Crimean Tatars Mustafa Dzhemilev President Putin informed him that the rights of this indigenous people are important to him and that he ordered to prevent any violence against the Crimean Tatars. On March 17, President Putin signed a decree recognizing Crimea as a sovereign state. The State Duma issued a statement that was supported by 441 legislators, with one abstention and said: "Welcoming the expression of will by the Crimean people at the March 16 referendum on accession of the Republic of Crimea and the city of Sevastopol to Russia, the State Duma proceeds from the standpoint that the government bodies operating on the territory of Crimea will be maintaining inter-faith accord and language diversity of the republic. The State Duma will contribute to ensuring the safety of all people staying in Crimea, regardless of their citizenship, nationality, language or religion, and to observing their legitimate rights and freedoms". Mayor of Moscow, Sergey Sobyanin congratulated residents of the Republic of Crimea. He recalled that Russians had always felt unity with Crimea and Sevastopol. Serbia – Ministry of Foreign Affairs refused to comment on Crimean referendum due to the caretaker status of the Government following the elections. South Korea – The Ministry of Foreign Affairs stated that "The sovereignty, territorial right and independence of Ukraine must necessarily be respected," adding that "Our government cannot recognize the (recent) referendum on Crimean people and Russia's (subsequent) annexation of Crimea." Turkey – The Ministry of Foreign Affairs of Turkey stated that, "The result of the unlawful and illegitimate 'referendum' held in Crimea on Sunday, 16 March 2014, and the de facto situation that will prevail following the steps that will be taken in conjunction with this referendum will not bear any legal validity for Turkey and will not recognize." Also, Turkey supports and recognizes Ukraine's territorial integrity, including Crimea. Foreign Minister Ahmet Davutoğlu has labeled the referendum as unhelpful in engendering a solution to the crisis. United Kingdom – Prime Minister David Cameron has declared that any referendum vote in Crimea will be "illegal, illegitimate, and will not be recognized by the international community." Foreign Secretary William Hague said that "I condemn the fact that this referendum has taken place. … The UK does not recognise the referendum or its outcome. … we believe measures must be adopted that send a strong signal to Russia that this challenge to the sovereignty and territorial integrity of Ukraine will bring economic and political consequences." United States – The United States will not recognize the results of the referendum, and will continue to consider Crimea as part of Ukraine. President Barack Obama claimed that the referendum would violate Ukrainian sovereignty and international law. The United States issued limited sanctions on a number of Russian and Crimean officials. Venezuela – Venezuelan President Nicolás Maduro has accused both the US and the EU of "double standards" over Crimea and recalled the Kosovo and Falkland Islands referendums as evidence. Vietnam – The Spokesman of the Ministry of Foreign Affairs Lê Hải Bình said that "the measures need to respect basic principles of international laws and legitimate aspirations of people so that the situation will soon be stable for peace and stability in the region and the world." Abkhazia – President Alexander Ankvab stated that he "respects the will of Crimeans, supports and recognizes their momentous choice" and that the referendum "reflects the will of multi-national people of the peninsula." Nagorno-Karabakh – Foreign Ministry of the NKR said in a statement on March 17 that the referendum is "yet another manifestation of realization of the right of people to self-determination." On March 18, a concert was held in Stepanakert dedicated to the "self-determination of Crimea" and was attended, among others, by President Bako Sahakyan. South Ossetia – Foreign Ministry stated that they "respect the right of population of Crimea to determine independently its fate." Transnistria|state – Irina Kubanskikh, a spokeswoman for the Transnistrian parliament, said that the region's public bodies had "appealed to the Russian Federation leadership to examine the possibility of extending to Trans-Dniester the legislation, currently under discussion in the State Duma, on granting Russian citizenship and admitting new subjects into Russia." Gábor Vona, leader of Hungary's Jobbik hailed the recent referendum in Crimea as "exemplary". Members of Austria's populist right-wing Freedom Party of Austria, the Flemish nationalist group Vlaams Belang and France's National Front pronounced the referendum free and fair. The next day after the referendum, the parliament of Crimea asked the Russian Federation "to admit the Republic of Crimea as a new subject with the status of a republic". Later on the same day, March 17, Putin issued a decree formally recognizing Crimea as an independent state. 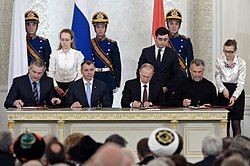 On March 18, the Russian, Crimean, and Sevastopolian leadership signed the Treaty on Accession of the Republic of Crimea to Russia, which was ratified by the Russian Federal Assembly on March 21. A transition period was in force for integrating Crimean governmental institutions, ending on January 1, 2015. After the seizure of Ukrainian naval base at Feodosia on March 24, Russian troops have seized most of Ukraine's military bases in Crimea. On the same day, the acting President of Ukraine, Oleksandr Turchynov, ordered the withdrawal of Ukrainian armed forces from Crimean peninsula. ^ a b c d Morello; Constable; Faiola (2014) "[Mikhail Malyshev, the Crimean election Spokesman,] who spoke briefly Monday morning on Crimean television, said a total of 1,274,096 people voted, for an 83.1 percent turnout. Of those who cast a ballot, [sic] 1,233,002 voted to shift to Russia, 31,997 voted to stay with Ukraine, and 9,097 were in invalid, Malyshev said." ^ Crimean Parliament (2014; in Russian) "Вопрос, получивший большинство голосов, считается выражающим прямое волеизъявление населения Крыма." ^ The Constitution of the Soviet Union did give the Republics of the Soviet Union the right to secede. ^ Urquhat; Williamson; Nelid (2014) "[Walker has] just come back from a rather bizarre "press conference" of international observers for the referendum. It was 45 minutes before there were any questions, as the six people present mainly went on political rants against US hegemony in the world." ^ a b c d "Crimea votes to join Russian Federation: 96.77% say YES". March 17, 2014. Retrieved March 17, 2014. ^ a b На сессии городского Совета утверждены результаты общекрымского референдума 16 марта 2014 года [Session of the City Council approved the results of the general referendum on March 16, 2014] (in Russian). Official site of the Sevastopol City Council. March 17, 2014. Archived from the original on July 22, 2014. ^ a b How Russia Took Crimea Macias, Amanda (2015). Business Insider. Retrieved August 1, 2017. ^ Putin Admits Russian Forces Were Deployed to Crimea Reuters (2014). Retrieved August 1, 2017. ^ The Crimea Crisis – An International Law Perspective Marxsen, Christian (2014). Max-Planck-Institut. Retrieved August 1, 2017. ^ Saideman, Stephen (March 12, 2014). "In Crimea's sham referendum, all questions lead to 'yes'". Globe and Mail. ... voters in Crimea next Sunday will be asked whether they support the union of Crimea with Russia (an act of irredentism) or whether Crimea should be independent (secession). There is no alternative – one cannot vote for the status quo ante of remaining within Ukraine. ^ a b "2 Choices in Crimea Referendum, but Neither Is 'No'". The New York Times. March 15, 2014. ^ Oliphant, Roland (March 16, 2014). "Crimeans vote peacefully in referendum, but have little choice". The Telegraph. ^ a b "U.S., EU set sanctions as Putin recognizes Crimea "sovereignty"". March 17, 2017 – via Reuters. ^ a b c "U.N. General Assembly Affirms Ukraine's Territorial Integrity, Calls The World Community Not To Recognise Change Of Crimea's Status". Ukrainian News Agency. March 27, 2014. Archived from the original on May 4, 2014. Retrieved March 27, 2014. ^ "Security Council Fails to Adopt Text Urging Member States Not to Recognize Planned 16 March Referendum in Ukraine's Crimea Region". Un.org. Archived from the original on March 15, 2014. Retrieved March 17, 2014. ^ "Russia Vetoes U.N. Security Council Resolution On Crimea". NPR. March 15, 2014. Retrieved March 17, 2014. ^ a b c "Mejlis to boycott Crimean referendum". Ukrinform.ua. March 6, 2014. Retrieved March 15, 2014. ^ a b "Tatar leader: referendum's results 'predetermined'". DW.DE. March 16, 2014. Retrieved March 17, 2014. ^ Shishkin, Philip. "Fear and Loathing Builds in Crimea Ahead of Vote". Online.wsj.com. Retrieved March 17, 2014. ^ "About number and composition population of Ukraine by data: All-Ukrainian population census 2001 data". State Statistics Committee of Ukraine. 2003. Archived from the original on December 17, 2011. Retrieved March 17, 2014. ^ Said, Hashem (February 3, 2014). 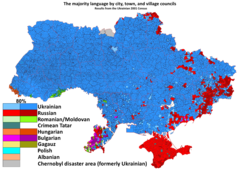 "Map: Russian language dominant in Crimea". Al Jazeera America. Retrieved March 17, 2014. ^ "Why Crimea is so dangerous". March 11, 2014 – via www.bbc.com. ^ "Don't let Russia abuse Crimean history". theglobeandmail.com. ^ a b Sasse, Gwendolyn (March 3, 2014). "Crimean autonomy: A viable alternative to war?". Washington Post. Retrieved March 6, 2014. ^ "17 March 1995 Law of Ukraine № 93-95/VR "On abrogation of the Constitution and specific acts of the Autonomous Republic of Crimea". Zakon4.rada.gov.ua. Retrieved March 15, 2014. ^ "Ukraine Moves To Oust Leader of Separatists". The New York Times. March 19, 1995. Retrieved March 2, 2014. ^ Public Opinion Survey Residents of the Autonomous Republic of Crimea May 16 – 30, 2013 (PDF). International Republican Institute. p. 17. ^ a b Ignatova, Olga (March 14, 2014). "Public opinion survey in Crimea" (PDF). GfK. Retrieved April 24, 2014. ^ Anne Gearan and Kathy Lally (March 15, 2014). "Talks in London between Kerry and Lavrov end with impasse on Ukraine". The Washington Post. Retrieved April 24, 2014. ^ "The Crimean conundrum". openDemocracy. March 3, 2015. Archived from the original on July 22, 2016. Retrieved July 11, 2016. ^ "February 2015 VCIOM public opinion poll of Crimean satisfaction with the 2014 referendum outcome" (PDF). ^ "Trigger Warning: Crimean Tatars Support Russia". Retrieved July 11, 2016. ^ Ott Ummelas (April 14, 2014). "Putin's 21-Year Quest to Be Russian Guardian Began in Estonia". Bloomberg. ^ "Conflict fears rise after pro-Russian gunmen seize Crimean parliament". The Guardian. February 28, 2014. ^ "Ukraine Alleges Russian 'Invasion' of Crimea as Obama Warns of 'Costs'". CounterCurrents.org. March 1, 2014. ^ a b c "Number of Crimean deputies present at referendum resolution vote unclear". Interfax-Ukraine. February 27, 2014. ^ Sergei L. Loiko (March 1, 2014). "New Crimea leaders move up referendum date". Los Angeles Times. Retrieved March 3, 2014. KIEV, Ukraine – Crimea's new pro-Moscow premier, Sergei Aksenov, moved the date of the peninsula's status referendum to March 30. On Thursday, the Crimean parliament, which appointed Aksenov, had called for a referendum on May 25, the date also set for the urgent presidential election in Ukraine. ^ "TsVK says that it is not possible to conduct the Crimean referendum". Ukrayinska Pravda (in Ukrainian). Retrieved February 27, 2014. ^ Merat, Arron (February 27, 2014). "Ukraine crisis: Ukraine searches for missing billions". Daily Telegraph. ^ webstudio, TAC. "Ukrainian Journal". ukrainianjournal.com. ^ Braden Goyette (March 6, 2014). "Crimea Referendum Vote On Joining Russia Scheduled For March 16". Huffington Post. Retrieved March 15, 2014. ^ "'There Was No Quorum': Crimean Lawmaker Calls Vote To Join Russia Flawed". Rferl.org. March 6, 2014. Retrieved March 15, 2014. ^ "Kırım vekilleri Rusya'ya katılmak için oy kullandıklarını bilmiyordu – Kırım Haber Ajansı". Qha.com.ua. March 8, 2014. Retrieved March 15, 2014. ^ Balmforth, Richard (March 11, 2014). "No room for 'Nyet' in Ukraine's Crimea vote to join Russia". Reuters. Retrieved March 16, 2014. ^ "Со здания Рады Крыма сняли герб Украины и повесили российский флаг : Новости УНИАН". Unian.net. Retrieved March 15, 2014. ^ "Ukrainian State Border Guard Service personnel keep performing tasks on enforcing border protection of South, East and West Ukrainian border". State Border Guard Service of Ukraine. March 10, 2014. Archived from the original on March 10, 2014. Retrieved March 15, 2014. ^ "Crimean Tatars face tough choice: dig in, or flee". Kyiv Post. March 11, 2014. ^ "Official voting bulletin" (PDF). Archived from the original (PDF) on March 16, 2014. Retrieved March 15, 2014. ^ "Provisional regulations on republican (local) referendum in the Autonomous Republic of Crimea" (PDF). rada.crimea.ua. Archived from the original (PDF) on April 18, 2014. Retrieved March 7, 2014. ^ a b "Ukraine crisis: Crimea parliament asks to join Russia". BBC News. March 6, 2014. Retrieved March 6, 2014. ^ "При воссоединении с Россией крымчане дискомфорта не почувствуют!". kryminfo.net. March 8, 2014. ^ a b "Парламент Крыма принял постановление "О проведении общекрымского референдума"". Пресс-центр Верховного Совета АРК (Press center of the Supreme Council of ARC). March 6, 2014. Archived from the original on March 6, 2014. ^ "Crimean parliament votes to join Russia, hold referendum in 10 days on ratifying". RT. March 6, 2014. Retrieved March 6, 2014. ^ "Севастополь принял решение о вхождении в состав РФ : Новости УНИАН". Unian.net. Retrieved March 7, 2014. ^ "Верховный Совет Автономной Республики Крым". Referendum2014.ru. Archived from the original on March 13, 2014. Retrieved March 15, 2014. ^ Kolstø, Pål; Edemsky, Andrei (1995). Russians in the Former Soviet Republics. C. Hurst & Co. Publishers. ISBN 978-1-85065-206-9. ^ Constitution of Crimea (May 6, 1992; in Russian) Article 9. "The Republic of Crimea is a part of Ukraine and establishes relations with it on a basis of treaty and contracts." Retrieved on March 15, 2014. ^ Saideman, Stephen (March 12, 2014). "In Crimea's sham referendum, all questions lead to 'yes'". Globe and Mail. ...voters in Crimea next Sunday will be asked whether they support the union of Crimea with Russia (an act of irredentism) or whether Crimea should be independent (secession). There is no alternative – one cannot vote for the status quo ante of remaining within Ukraine. ^ "Two choices in Crimean referendum: yes and yes". Kyiv Post. March 7, 2014. ^ "Crimea parliament vote offers two choices on Russia – join now or later". Fox News. March 11, 2014. Retrieved March 15, 2014. ^ Бюллетени всекрымского референдума напечатают на трех языках | Крымское информационное агентство (in Russian). Kianews.com.ua. March 7, 2014. Retrieved March 7, 2014. ^ "Possible irregularities seen in Crimea referendum – Yahoo News". ^ "Crimea referendum: early results indicate 'landslide' for secession – as it happened". The Guardian. March 16, 2014. ^ Henton, George. "In Pictures: Crimea's referendum". aljazeera.com. ^ "Crimea parliament declares independence from Ukraine ahead of referendum". Retrieved July 14, 2016. ^ "Crimea referendum: What does the ballot paper say? – BBC News". Retrieved July 14, 2016. ^ "Ukraine crisis: Crimea MPs vote to join Russia". BBC News. March 6, 2014. Retrieved March 6, 2014. ^ Bell, Yvonne (March 10, 2014). "Russia 'will fix' Crimea referendum, says Tatar leader". Reuters. Retrieved March 17, 2014. ^ Tanner, Adam; Stevenson, Reed (July 22, 2010). "Kosovo independence declaration deemed legal". Reuters. Retrieved August 3, 2010. ^ Rapoza, Kenneth (March 10, 2014). "Putin Defends Crimea Referendum To Join Russia". Forbes. Retrieved March 11, 2014. ^ "Crimean assembly declares independence from Ukraine". Presstv.ir. March 11, 2014. Retrieved March 15, 2014. ^ a b "Why the Crimean Referendum Is Illegitimate". cfr.org. ^ a b "Experts: Crimea isn't comparable to Kosovo". aa.com.tr. ^ a b Weller, Marc (March 7, 2014). "Analysis: Why Russia's Crimea move fails legal test". BBC News. Retrieved March 12, 2014. ^ "Закон України "Про всеукраїнський референдум"". Search.ligazakon.ua. November 28, 2012. Retrieved March 15, 2014. ^ "Yanukovych's removal was unconstitutional". GeoPolitical Forecasts. March 1, 2014. Retrieved July 12, 2016. ^ "Venice Commission. CDL-AD(2014)002". March 21, 2014. Retrieved April 10, 2014. ^ "Укрінформ: Тимошенко: Референдум про статус Криму під дулами автоматів є нелегітимним". Ukrinform.ua. August 21, 2013. Archived from the original on March 28, 2014. Retrieved March 15, 2014. ^ a b "Crimean 'referendum at gunpoint' is a myth – into observers". RT.com. March 16, 2016. Retrieved August 25, 2016. ^ "Crimea referendum held in line with international standards — observers". TASS.ru. March 17, 2014. Retrieved July 14, 2016. ^ "Party of Regions must stop Crimean referendum – Miroshnychenko". Ukrinform.ua. March 11, 2014. Retrieved March 15, 2014. ^ "Yanukovych s speech in Rostov looked pathetic – Herman". Ukrinform.ua. March 11, 2014. Retrieved March 15, 2014. ^ "Джемилев: Путин заявил о незаконном выходе Украины из состава СССР". RosBalt. March 12, 2014. ^ "Putin: referendum in Crimea fully complied with international law norms". Retrieved July 14, 2016. ^ "Crimea Poster". Business Insider. March 10, 2014. Retrieved March 15, 2014. ^ "Twitter / MareikeAden: Now saw this with own eyes". Twitter.com. March 10, 2014. Retrieved March 15, 2014. ^ "Twitter / ru_rbc: Вы хотите". Twitter.com. March 10, 2014. Retrieved March 15, 2014. ^ "Video: Xenophobic Ukrainian MP beats state TV channel head". March 19, 2014. ^ "OSCE observers weren't officially invited to Crimean referendum – Crimean authorities". En.interfax.com.ua. March 11, 2014. Retrieved March 15, 2014. ^ a b "Crimea invites OSCE observers for referendum on joining Russia". Reuters. March 10, 2014. Retrieved March 10, 2014. ^ Firstpost (March 12, 2014). "Crimea referendum illegal, no OSCE monitoring – Swiss". Firstpost. Retrieved March 15, 2014. ^ "Thwarted Crimea mission of OSCE observers". euronews.com. March 15, 2014. ^ "Warning shots fired as OSCE mission turned away from Crimea". March 8, 2017 – via Reuters. ^ Sandra Štefaniková (March 19, 2014). "Politici jeli na Krym s extremisty. Bylo to narychlo, říkají". Aktuálně.cz. Retrieved March 20, 2014. ^ "OSCE team says Crimea gunmen threatened to shoot at them". Worldbulletin.net. March 12, 2014. Retrieved March 15, 2014. ^ "UN Human Rights Envoy In Ukraine Unable To Reach CrimeaTalk Radio News Service". Talkradionews.com. March 11, 2014. Archived from the original on March 15, 2014. Retrieved March 15, 2014. ^ "Около 70 наблюдателей из 23 стран зарегистрировались для работы на референдуме в Крыму". Russian.rt.com. March 15, 2014. Retrieved March 15, 2014. ^ "Paving the future: Ukraine's Crimea goes to independence poll". rt.com. ^ "Crimea's Technically Flawed Referendum". The Huffington Post. ^ Jefim Fištejn (March 20, 2014). "KOMENTÁŘ: Děsivá pohádka o referendu a "Putinových" pozorovatelích". iDNES.cz. Retrieved March 25, 2014. ^ "Crimean referendum in line with int'l standards, laws – Austrian observer". sputniknews.com. Retrieved July 14, 2016. ^ Snyder, Timothy (March 2014). "Far-Right Forces are Influencing Russia's Actions in Crimea". The New Republic. ^ spa (Šárka Pálková) (March 20, 2014). "Berkovcova mise na Krym. Tají organizátora i financování". Lidovky.cz. Retrieved March 22, 2014. ^ Conal Urquhart, Lewis Williamson and Barry Neild (March 15, 2014). "Russia vetoes Crimea motion as Kiev claims it repelled Russian troops in south Ukraine". The Guardian. Retrieved March 17, 2014. ^ "Вести.Ru: Власти Крыма: референдум – законное право народа". Vesti.ru. March 15, 2014. Retrieved March 17, 2014. ^ a b "Declaring victory, Crimean and Russian officials pledge fast integration". Kyiv Post. March 17, 2014. ^ "Unknown people seize passports of Crimean residents – Crimean News Agency". Qha.com.ua. March 10, 2014. Retrieved March 15, 2014. ^ Croft, Aleksandar Vasovic and Adrian. "U.S., EU set sanctions as Putin recognises Crimea "sovereignty"". reuters.com. ^ "Crimea Votes To Join Russia, European Union Imposes Sanctions". Huffington Post. ^ Bullough, Oliver (March 2014). "The Crimean Referendum to Join Russia Was an Unconstitutional Sham". New Republic. ^ "Cestu Šarapatky na Krym platila organizace ultrapravicového aktivisty". Česká televize. March 19, 2014. Retrieved May 9, 2015. ^ "Politici jeli na Krym s extremisty. Bylo to narychlo, říkají". Aktuálně. March 19, 2014. Retrieved May 9, 2015. ^ Kateřina Perknerová. Poslanec Berkovec: I pro krymské Tatary je Rusko symbolem jistoty. deník.cz. March 18, 2014. ^ Martin Dorazín, Jaromír Marek, Veronika Sedláčková. Na Krymu začaly změny. Má parlament s novým jménem a bude mít i nový čas. Czech Radio. March 17, 2014. Accessed March 18, 2014. ^ jek, kat (March 19, 2014). "Cestu Šarapatky na Krym platila organizace ultrapravicového aktivisty". Czech Television. Retrieved March 20, 2014. ^ State voters registry. Central Election Commission of Ukraine. ^ Morello, Carol; Constable, Pamela; Faiola, Anthony (March 17, 2014). "Crimeans vote in referendum on whether to break away from Ukraine, join Russia". The Washington Post. Retrieved March 17, 2014. ^ Video: Более 95% избирателей в Крыму захотели вернуться в состав России. ntv.ru. March 17, 2014. Accessed March 18, 2014. ^ По предварительным данным, за присоединение к России проголосовали 95,5% крымчан. ITAR-TASS. March 17, 2014. Accessed March 18, 2014. ^ "В Севастополе за присоединение к России проголосовало 123% населения". unian.net. ^ MacAskill, Ewen; Washington, Ian Traynor Dan Roberts in (March 17, 2014). "EU and US impose sanctions on Russian and Ukrainian officials". The Guardian. ^ Adesnik, David. "How Russia Rigged Crimean Referendum". forbes.com. ^ "За слияние с Россией проголосовало 123% севастопольцев". pravda.com.ua. ^ "Проблемы жителей Крыма". president-sovet.ru. ^ Купчинецкая, Виктория (March 31, 2014). "Мустафа Джамилев выступил в Совете Безопасности ООН". Voice of America. Retrieved April 1, 2014. ^ "Crimea Referendum: 34 Percent, Not 97 Percent, Says Former Russian Government Adviser". Guardian Liberty Voice. ^ "Ukraine Political Attitudes Split, Crimeans Turning to Russian Sources For News". Broadcasting Board of Governors. June 3, 2014. Retrieved June 5, 2014. ^ a b "Contemporary Media Use in Ukraine" (PDF). Broadcasting Board of Governors. June 3, 2014. Retrieved September 21, 2014. ^ "Despite Concerns about Governance, Ukrainians Want to Remain One Country". Pew Research Center. May 8, 2014. Retrieved May 19, 2014. ^ a b Bershidsky, Leonid (February 6, 2015). "One Year Later, Crimeans Prefer Russia". Bloomberg News. ^ "Crimean Tatar Leader Tells People To Stay At Home, Avoid Confrontations". Rferl.org. March 2, 2014. Retrieved March 7, 2014. ^ a b c d De Carbonel, Alissa (March 6, 2014). "Harper, world leaders reject proposed Crimean referendum". Globe and Mail. ^ Talk to Al Jazeera (March 2014). "Yulia Tymoshenko: 'Kremlin has declared war'". Al Jazeera English. Retrieved March 15, 2014. ^ "Європа вважає відокремлення Криму від України неприйнятним – Німеччина". Radiosvoboda.org. March 11, 2014. Retrieved March 15, 2014. ^ "Ukraine: MEPs call for firm action on Russia to prevent further escalation". Europarl.europa.eu. March 12, 2014. Retrieved March 15, 2014. ^ "G7 not to recognize Crimea referendum – Xinhua | English.news.cn". News.xinhuanet.com. March 12, 2014. Archived from the original on March 31, 2014. Retrieved March 15, 2014. ^ "Ukraine crisis: Russia isolated in UN Crimea vote". BBC News. March 15, 2014. Retrieved March 17, 2014. ^ "Unrest in eastern Ukraine risks 'seriously destabilizing' entire country – UN rights official". United Nations. April 16, 2014. Retrieved April 16, 2014. ^ Recent developments in Ukraine: threats to the functioning of democratic institutions (Doc. 13482), Part B, paragraph 82, page 17. ^ "NATO says Crimea referendum would break international law". Reuters. March 14, 2014. Retrieved March 14, 2014. ^ "Russia's accusations – setting the record straight". NATO. April 12, 2014. Retrieved April 12, 2014. ^ "Crimea referendum 'illegal': Council of Europe panel". The Economic Times. March 21, 2014. Retrieved March 21, 2014. ^ a b "CDL-AD(2014)002-e Opinion on "whether the decision taken by the Supreme Council of the Autonomous Republic of Crimea in Ukraine to organise a referendum on becoming a constituent territory of the Russian Federation or restoring Crimea's 1992 constitution is compatible with constitutional principles" adopted by the Venice Commission at its 98th Plenary Session (Venice, 21–22 March 2014)". Venice Commission. March 21, 2014. Retrieved March 21, 2014. ^ Matthew Rosenburg (March 23, 2014). "Breaking With the West, Afghan Leader Supports Russia's Annexation of Crimea". The New York Times. ^ Ana Clara Pérez Cotten (March 26, 2014). "Putin coincidió con Cristina en el doble estándar sobre Crimea y las Malvinas". InfoNews. ^ "The answer of Foreign Minister Edward Nalbandian to a question by "First news" service". Ministry of Foreign Affairs of Armenia. March 17, 2014. Retrieved March 18, 2014. ^ "Armenian and Russian presidents say Crimea referendum an example of peoples' right to self-determination". arka.am. ^ "Today the President of Armenia held a Telephone Conversation with the President of Russia". Office to the President of the Republic of Armenia. March 19, 2014. Retrieved March 19, 2014. ^ "Sarkisian Backs Crimean Referendum in Phone Call with Putin". Asbarez. March 19, 2014. Retrieved March 20, 2014. ^ "Ukrainian Embassy to Armenia does not comment onTyahnybok's urge to recall Ambassador". Armenpress. March 20, 2014. Retrieved March 20, 2014. ^ "Australia imposes sanctions on Russia after it 'steals' Crimea from Ukraine". The Guardian. March 19, 2014. ^ President of the Republic of Belarus Alexander Lukashenko answers questions of mass media representatives on 23 March 2014. president.gov.by. March 23, 2014. ^ Diplomat, Shannon Tiezzi, The. "China Reacts to the Crimea Referendum". thediplomat.com. ^ "China warns of dangerous Russia sanctions 'spiral'". March 13, 2017 – via Reuters. ^ "President of the Republic and Cabinet Committee on Foreign and Security Policy discussed situation in Ukraine". ^ "France Says Russia Sanctions Could Be Imposed This Week". Rferl.org. March 11, 2014. Retrieved March 15, 2014. ^ Walsh, Nick (March 12, 2014). "Ukraine's PM visits U.S. as Crimea heads for vote on joining Russia". CNN. According to the 1992 Constitution, Crimea is really an independent state. ^ "Tbilisi does not Recognize Crimea Vote". Civil Georgia. March 16, 2014. Retrieved March 18, 2014. ^ "Georgian President Condemns 'Illegal Referendum' in Crimea". Civil Georgia. March 17, 2014. Retrieved March 18, 2014. ^ "The Ministry of Foreign Affairs of Hungary regards changing Crimea's status as unlawful". Ministry of Foreign Affairs of Hungary. March 19, 2014. Archived from the original on May 27, 2014. Retrieved May 27, 2014. ^ "Foreign Minister expresses concerns over illegitimate referendum in Crimea". Ministry for Foreign Affairs. March 14, 2014. Retrieved March 14, 2014. ^ "India not to support western sanctions against Russia". The Times of India. March 19, 2014. ^ "Indonesia Rejects Crimean Referendum". Tempo. March 19, 2014. ^ "Kyrgyzstan Says Yanukovych Not Ukrainian President". Radio Free Europe/Radio Liberty. March 11, 2014. Retrieved March 15, 2014. ^ "Kyrgyzstan Recognizes Crimea Referendum Results". RIA Novosti. ^ "Japan imposes sanctions on Russia over Crimea". Philippine Daily Inquirer. March 16, 2014. Retrieved March 17, 2014. ^ "Crimea referendum illegal and illegitimate". Ministry of Foreign Affairs. March 14, 2014. Retrieved March 14, 2014. ^ "DFA Statement on the Crimea". Department of Foreign Affairs. March 18, 2014. Retrieved March 18, 2014. ^ Ministry of Foreign Affairs, Poland among leaders of expert support for Ukraine April 1, 2014. ^ "Băsescu: Romania will NOT recognize the Crimean referendum results". Mediafax. March 16, 2014. Retrieved March 17, 2014. ^ "Titus Corlăţean, about the Crimean referendum: the result will not be recognized by the democratic international community". Digi24. March 16, 2014. Archived from the original on March 17, 2014. Retrieved March 17, 2014. ^ "As it happened: Pressure on Russia". BBC News. March 6, 2014. Retrieved March 10, 2014. ^ Dahlburg, John-Thor (March 10, 2014). "Putin defends referendum on secession in Crimea". The Spokesman-Review. Associated Press. Retrieved March 10, 2014. ^ "Mustafa Jemilev talked with Vladimir Putin on the phone". Crimean News Agency. March 12, 2014. Retrieved March 15, 2014. ^ "Putin signs decree recognising Crimea as sovereign and independent state". TASS. ^ "Russian lawmakers issue statement on situation in Crimea". TASS. ^ "Moscow mayor congratulates Crimea residents on decision to join Russia". TASS. ^ "MSP ne može da komentariše Ukrajinu". B92. ^ "Seoul refuses to recognize Russia's Crimea annexation". The Korea Herald. ^ "No: 86, 17 March 2014, Press Release Regarding the Referendum held in Crimea". Ministry of Foreign Affairs of Turkey. March 17, 2014. Archived from the original on March 18, 2014. Retrieved March 18, 2014. ^ "Turkey will continue to protect Crimean Tatars' rights, says Davutoğlu". Today's Zaman. March 7, 2014. Archived from the original on March 14, 2014. Retrieved March 15, 2014. ^ "Ukraine to block Crimea's referendum decision". Anadolu Agency. March 6, 2014. Retrieved March 7, 2014. ^ "David Cameron: Russia may face EU sanctions within days". BBC News. March 10, 2014. Retrieved March 15, 2014. ^ "UK will not recognise referendum in Crimea". Anadolu Agency. March 10, 2014. Retrieved March 15, 2014. ^ Sengupta, Kim (March 17, 2014). "Crimea crisis: Foreign leaders condemn 'Russia's destabilising actions' as 93% vote in referendum for secession". The Independent. Retrieved March 17, 2014. ^ "US not recognizing any results of Crimean referendum – Pyatt". En.interfax.com.ua. October 20, 2012. Retrieved March 15, 2014. ^ "Peaceful solutions to Crimea, Sevastopol issue". Retrieved March 22, 2014. ^ a b "Sokhumi, Tskhinvali Recognize Crimea Vote". Civil Georgia. March 17, 2014. Retrieved March 18, 2014. ^ "Karabakh Recognizes Crimea". Asbarez. March 17, 2014. Retrieved March 17, 2014. ^ Musayelyan, Lusine. "Ղարաբաղում տոնական համերգով ողջունում են Ղրիմի ինքնորոշումը [Crimea's self-determination celebrated in Karabakh]" (in Armenian). Radio Free Europe/Radio Liberty Armenian Service. Retrieved March 20, 2014. ^ "Moldova's Trans-Dniester region pleads to join Russia". BBC News. March 18, 2014. ^ Giannangeli, Marco (June 1, 2014). "Nigel Farage is another of Moscow's darlings as Putin backs Right". Sunday Express. Retrieved June 1, 2014. ^ Riedl, Joachim (April 10, 2015). "Rechtspopulismus in Österreich: Ausgrenzen genügt nicht" – via Die Zeit. ^ Higgins, Andrew (May 20, 2014). "Far-Right Fever for a Europe Tied to Russia". The New York Times. Retrieved June 1, 2014. ^ "Crimea applies to be part of Russian Federation after vote to leave Ukraine". The Guardian. March 17, 2014. ^ "Путин подписал указ о признании Крыма независимым государством". RIA Novosti. March 17, 2014. ^ "Договор между Российской Федерацией и Республикой Крым о принятии в Российскую Федерацию Республики Крым и образовании в составе Российской Федерации новых субъектов". Kremlin. ^ "Russian Federation Council ratifies treaty on Crimea's entry to Russia". ITAR TASS. March 21, 2014. Retrieved March 21, 2014. ^ Anatoliy Pronin. "A treaty of accession of the Republic of Crimea and Sebastopol to the Russian Federation. Unofficial English translation with little commentary". Academia.edu. Retrieved April 2, 2014. ^ "Ukraine orders Crimea troop withdrawal as Russia seizes naval base". CNN. March 24, 2014. Retrieved March 24, 2014. ^ Ilya Somin (May 6, 2014). "Russian government agency reveals fraudulent nature of the Crimean referendum results". The Washington Post. ^ News, Sarah Rainsford BBC. "Ukraine crisis: Crimean Tatars uneasy under Russia rule". BBC News. Retrieved January 2, 2016. ^ Крымским татарам запретили митинговать [Crimean Tatars have been banned from holding protest rallies] (in Russian). gazeta.ru. May 17, 2014. Retrieved March 24, 2014. ^ a b Hille, Katherine (May 18, 2014). "Crimean Tatars defy ban on rallies to commemorate deportation". Financial Times. Retrieved May 19, 2014. ^ a b Winning, Alexander (May 18, 2014). "Crimean Tatars commemorate Soviet deportation despite ban". Reuters. Retrieved May 19, 2014. ^ "Crimea helicopters try to disrupt Tatar rallies". BBC News. May 18, 2014. Retrieved May 19, 2014. Wikimedia Commons has media related to Crimean status referendum, 2014.